This casino belongs to the British company PLSL (Park Lane Services Limited), the office of which is Located in London. Servers are registered in Panama. 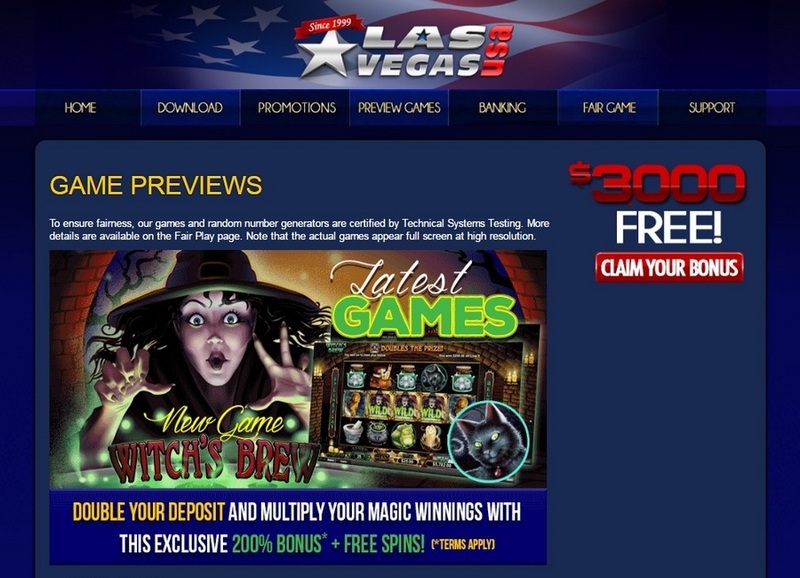 Las Vegas USA Casino uses the modern casino software RTG. It is available in the downloaded version and also right on the site. The organization cooperates with the independent organization Technical System Testing. For resolving of controversial issues between clients and administration, it is possible to address to Central Disputes System, having filled the form on the website of the organization. Las Vegas USA is offered only in English. Users from different countries are allowed playing on this platform. Especially gaming machines impress with magnificent graphics, bonus games, and smart soundtrack. Also on the platform of hazardous entertainments, the set of options of roulette, poker, and other popular games are available. Arcadian games offer one of the fascinating games – Derby Game & Pop Bingo. Each player can try good luck & break one of them. The min and max sizes of deposits depend on the chosen method & can make a sum from one dollar to five thousand. It is possible to output money with the check or money transfer. It is possible to output the won amount beginning with ten dollars through Neteller, and from hundred (or even four hundred) dollars with other systems. The incentive Las Vegas USA program is allowed both for new and regular customers. For people who opens the account on the website for the first time, get 150% bonus (about $3000), which is charged on the starting deposit from twenty dollars. If to make inputs with the gift card of MST, the casino will give additional twenty-five dollars. The casino deposit bonus needs to be won back thirty times (and fifty times in some games), according to the rules accepted on the platform. It is also possible to input the sum exceeding $1000 among the first deposits, then the player will get an elite bonus, the size of which sometimes reaches $4000. Actions for constant players include bonuses every week and the program of loyalty with favorable conditions. The casino encourages the players making money inputs with the help of payment service providers, preferable to them. In this case, the visitor can rely on a bonus from 10% to 15%. 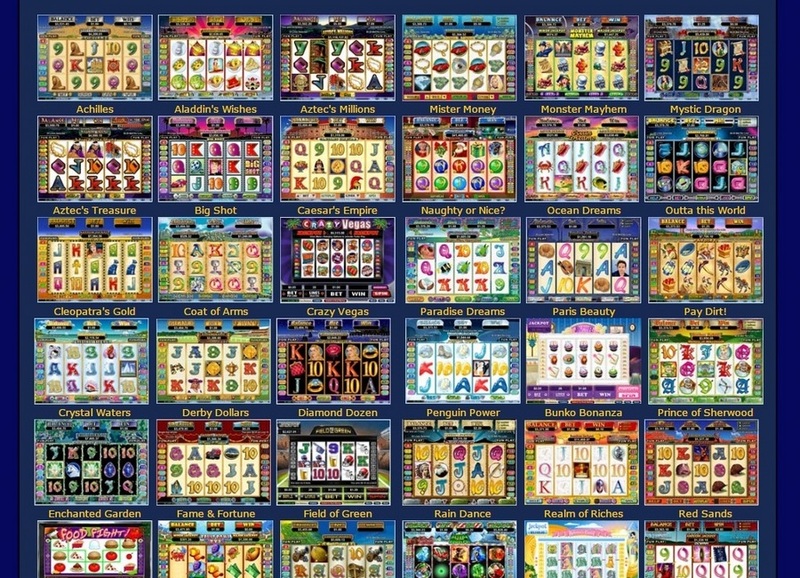 Each player has an opportunity to play not only in Casino Lobby Online but also to download the application on the personal computer for bigger convenience. Unfortunately, the website doesn't give a game opportunity with real dealers. 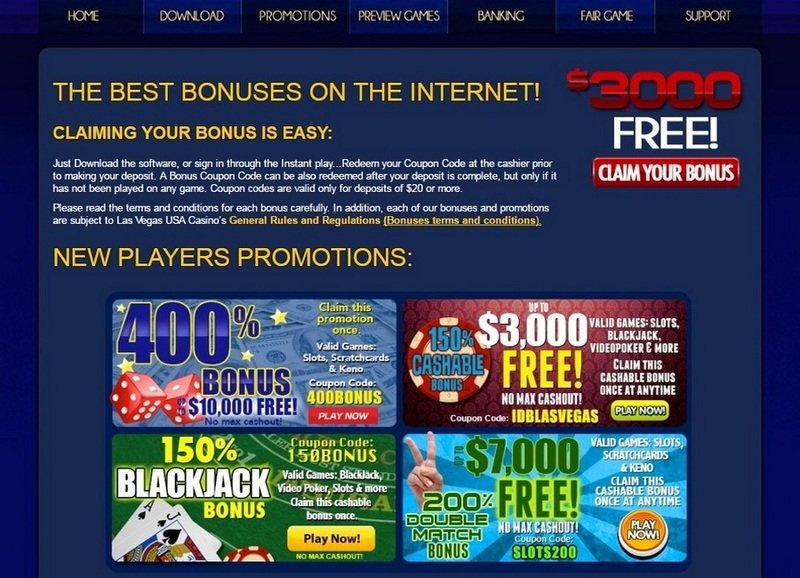 It is possible to connect with employees of the round-the-clock support of casino Las Vegas USA by phone (free number for the USA & Canada), e-mail or directly in an online chat. There are restrictions on a number of the countries, such as Arab Emirates, Afghanistan, the Netherlands Antilles, Belgium, Bulgaria, Congo, China, and others. You can look at the complete list on the official site.